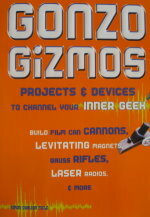 In this section we will build a toy called the Polariscope. 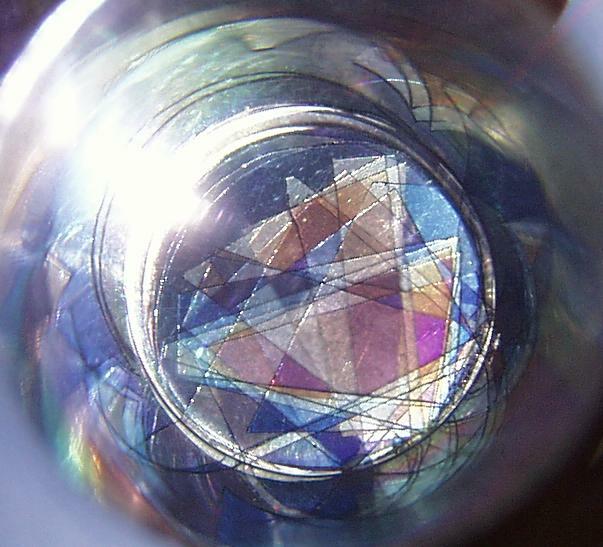 As you can see from the above photograph, the Polariscope creates patterns of beautiful colors, somewhat like a kaleidoscope, but by an entirely different mechanism. 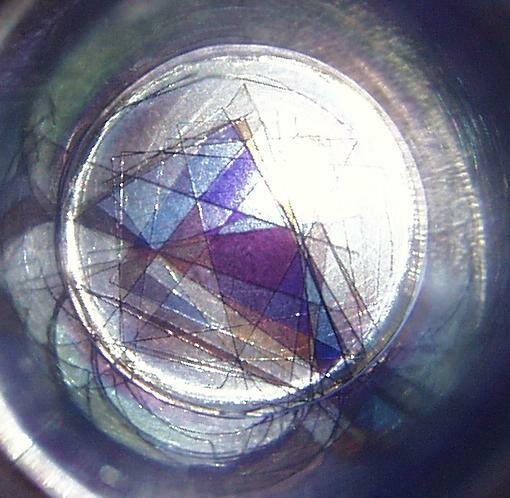 In fact, the Polariscope is made mostly of transparent plastic, and none of the fascinating colors are visible in any of the parts out of which it is made. The colors only appear when the toy is finally assembled, and you look through it. Like a kaleidoscope, when you shake the Polariscope you get a new pattern, and new colors, and the view is never the same twice. Notice that the pieces are all colorless and clear (the polarizers are a little bit gray, and the mylar is a tiny bit purple). The largest part is an eight inch long clear plastic rod an inch in diameter. This type of rod (called Lucite or Plexiglass) is available in plastics shops. The next piece is a piece of clear plastic tubing made of the same material as the rod. It has a one inch inside diameter, is an inch and a quarter long, and the walls are an eighth of an inch thick. Next are the polarizers. These are circles cut from Polaroid film. This can be from cheap sunglasses, or you can get them out of old or broken LCD displays, such as from a watch or a small video game. They can also be ordered from scientific supply houses such as Edmund Scientific. Next comes a bunch of cut up pieces of Mylar film (from the same plastics shop). These are cut into triangles mostly, although you can get creative with the shapes if you like. A piece of the plastic rod, about a third of an inch thick, forms a plug to keep all mylar film and the polarizers in place. The plastics shop can cut and polish the ends of the rod and plug for you, or you can do it yourself. The rod cuts easily with a fine toothed saw (such as a hacksaw), and is easily polished by successive grades of sandpaper, up to 600 grit. After the 600 grit paper, polishing compound on a soft cloth will make the surface transparent. 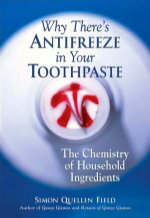 The polishing compound can be found at the plastics shop, or in any good hardware store. The pieces are then assembled. The rod fits into the tube, about a third of an inch in. Then the first polarizer is placed into the tube on top of the rod. Next the Mylar pieces are poured in. The second polarizer is then added, and finally the plug. The plug should not be pressed hard against the films, since they must be free to move about easily as you shake the Polariscope. To view through the Polariscope, hold the end with the polarizers toward the light, and put your eye up to the other end. Notice the colors change as you shake the Polariscope, or turn it on its axis. Also notice that the colors are reflected in the walls of the tube, making loops and curves out of the straight edges. 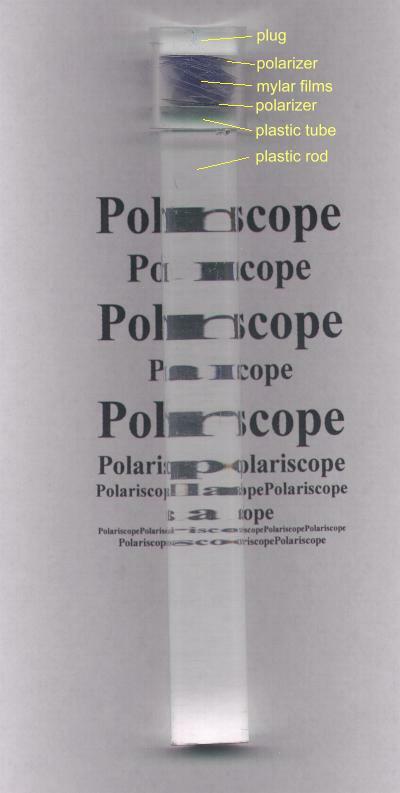 The Polariscope makes use of a special property of light calledpolarization. To understand polarization, it helps to have a little background on electromagnetic waves, such as light, heat, radio waves, xrays, and gamma rays. Electromagnetic waves are generated when a charged object is moved. The faster the charged object moves, the more energy goes into the production of the waves, and the waves are higher in frequency. The lowest frequency electromagnetic waves are radio waves. These can be generated by moving electrons in wires. Infrared radiation can be generated by the motion of molecules bouncing around as they are heated. As a material gets hotter, the molecules (and their electrons) move faster, and the frequency of the infrared light generated gets higher. Visible light can be generated by moving electrons within an atom. Gamma rays can be generated by moving charges in the nucleus of an atom, or by destroying charged particles by colliding them with their antimatter counterparts. It is easy to generate low frequency radio waves using a coil of wire, such as we find in electric motors. When we connect a coil of wire to a battery, electrons flow from the battery into the coil of wire. Moving electrons are what create magnetic fields. Electricity and magnetism can be thought of as two aspects of the same thing. Moving electrons create magnetic fields, and moving magnetic fields cause electrons to move. As the electrons move into the coil of wire, they create a magnetic field. The magnetic field starts out small, and builds up as the flow of electrons builds up. At some point the current in the wire reaches its maximum (determined by the voltage of the battery, and the resistance of the circuit), and the magnetic field also reaches its maximum. 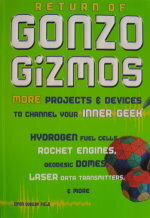 If we disconnect the battery, the flow of electrons is no longer driven by the chemical forces in the battery. The magnetic field, no longer supported by the battery, begins to collapse. But since a collapsing magnetic field is a moving magnetic field, it causes the electrons in the wire to move. The electrons are pushed by the magnetic field in the same direction that the battery used to be pushing them. Eventually the magnetic field completely collapses, and the electrons stop moving. We know from playing with magnets that a magnetic field can affect things at a distance. We know from playing with static electricity that charged objects can also affect things at a distance (rub a balloon on a cat and watch the cat fur rise as it is attracted to the balloon). We have seen that as electrons start flowing in a wire, a magnetic field starts building up. We have also seen that as a magnetic field collapses it causes electrons to flow in the wire. The magnetic field and the electric field can thus be made to oscillate back and forth. As one collapses, it builds up the other. Magnetic fields have a north and a south. Electric fields have a positive and a negative. You can picture the two fields as the height and width of a balloon as you push down on it with your hand. As the height of the balloon collapses, the width of the balloon expands. The height is like the magnetic field, and the width is like the electric field. Notice that the two fields are always at right angles to one another. This is important to understanding polarization. Electromagnetic waves are oscillating magnetic and electric fields, at right angles to one another. They move at the speed of light (light is, after all, an electromagnetic field). Most light that we encounter is randomly oriented with respect to the oscillating fields. Since the fields are created by moving electrons, and the electrons could be moving in any direction, the fields (electric and magnetic) could be at any angle. If something causes the electrons to all move in the same direction, then the fields would all be oriented in one direction. We would say the fields are polarized (they all have their north and south poles pointing the same way). In our wire, the electrons are all moving in the same direction, from one end of the wire to the other. The electric and magnetic fields produced by the moving electrons are all produced in the same orientation, and the waves are polarized. Light from the sun or a candle is caused by electrons moving in all different directions, so the fields are all randomly oriented. Their light is not polarized. The easiest way to polarize light from the sun or a candle is to reflect it off of a flat surface at a shallow angle. Sunlight glancing off of water into your eyes is polarized if it comes to you from a shallow enough angle. The electric field becomes oriented up and down, and the magnetic field is thus left and right (remember they are always at right angles to one another). Some materials have their atoms aligned in rows that only allow light waves to pass through them if the electric field is perpendicular to the rows of atoms. The electric field that is parallel to the rows of atoms is absorbed by the electrons in the atoms, causing the atoms to vibrate and heat up. The waves with electric fields that are not parallel to the rows of atoms are not affected, and travel through. Such a material is called a polarizing filter. Some sunglasses are made with polarizing filters in each lens. The filter is oriented to be at 90 degrees to the light reflected off of horizontal surfaces like the water in our previous example. These filters block the light that was reflected at shallow angles, thus reducing the glare from the water (or from the sloped rear window of the car ahead of you on the street). You can see this effect more clearly by rotating the glasses so they are up and down, and noticing that the glare is not reduced nearly as much as it was when the glasses were on your face in their normal position. Other materials can affect polarized light in a different way. If the molecules of a transparent substance are not symetrical, they will have more electrons on one side of the molecule than on the other. Remember that electrons and electromagnetic waves are closely related, and they affect one another. 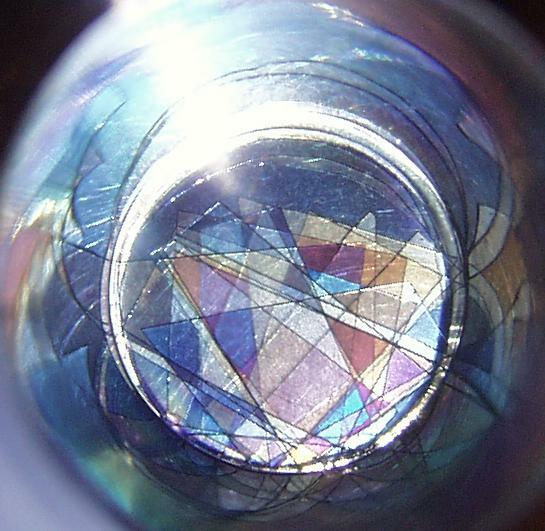 The lopsided molecules can rotate the plane of polarization of the light as it passes through the material. The amount of rotation depends on how many wavelengths of material the light passes through. The thicker the material, the more the light is rotated. Also, the higher the frequency of light, the more the light is rotated (since there are more wavelengths in the same thickness). 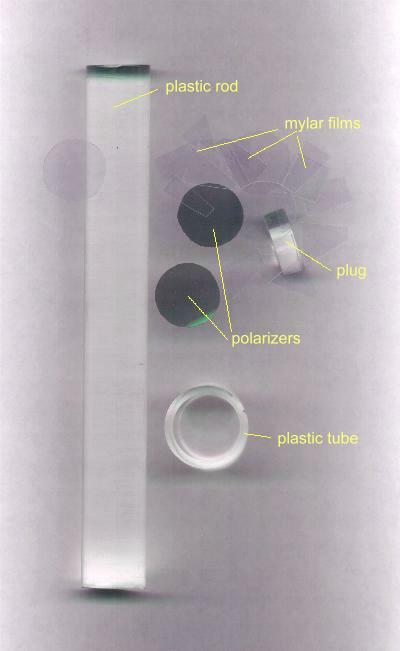 The Mylar pieces in the Polariscope can rotate the plane of polarization of the light. In the Polariscope, light enters first through the outer polarizing filter. 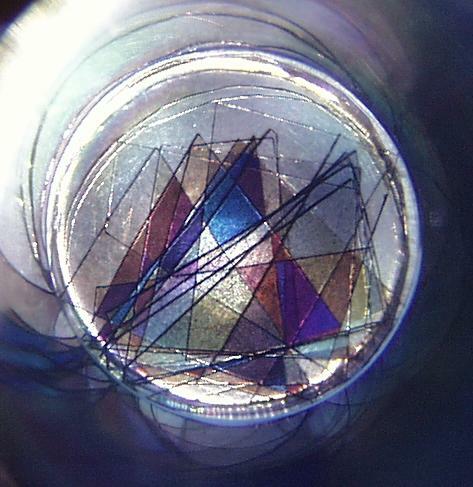 This polarized light then gets rotated when it passes through the Mylar. This rotated light now tries to get through the second polarizing filter, but since it has been rotated, it gets blocked. But white light contains lots of colors (lots of different frequencies of light). Different frequencies of light (different colors) are rotated by different amounts. Some colors will thus be rotated enough to get through the second polarizer, while other colors will be blocked. As the light goes through different thicknesses of Mylar, it gets rotated by different amounts. Thus different colors will be blocked by different thicknesses of Mylar. This is the magic of the Polariscope. Clear pieces of plastic can affect the colors of light that are allowed to pass though the filters. We see colors, even though there is nothing colored in the device itself.